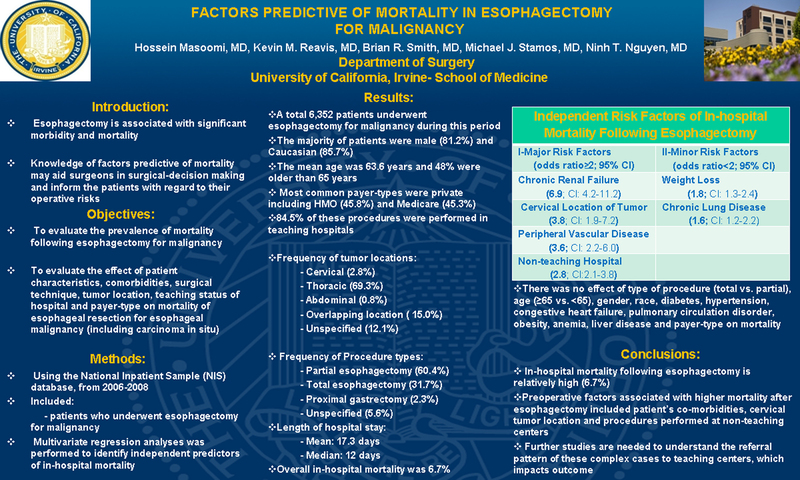 Introduction: Esophagectomy is associated with significant morbidity and mortality. Knowledge of factors predictive of mortality may aid surgeons in surgical-decision making and inform the patients with regard to their operative risks. Objective: To evaluate the effect of patient characteristics [age (<65 vs. ≥65), gender and race], comorbidities, surgical technique, tumor location (cervical, thoracic and abdominal), teaching status of hospital and payor-type on mortality of patients who underwent esophageal resection for esophageal malignancy. Methods: Using the National Inpatient Sample (NIS) database, clinical data of patients who underwent esophagectomy (trans-hiatal and trans-thoracic) and proximal gastrectomy with the diagnosis of esophageal malignancy including carcinoma in situ from 2006-2008 were examined. Univariate and multivariate regression analysis were performed to identify independent predictors of in-hospital mortality. Results: A total 6,352 patients underwent esophagectomy for malignancy during this period [trans-hiatal (60.4%), trans-thoracic (31.7%), proximal gastrectomy (2.2%) and unspecified (5.7%)]. The majority of patients were male (81.2%) and Caucasian (85.7%).The mean age was 63.6 years and 48% were older than 65 years. The most common payor-types were private including HMO (45.8%) and Medicare (45.3%). 84.5% of these procedures were performed in teaching hospitals. The median length of stay was 12 days and overall in-hospital mortality was 6.7%. Using multivariate regression analysis for factors predictive of higher in-hospital mortality, renal failure [odds ratio (OR): 6.9], cervical location of malignancy (OR: 3.8), peripheral vascular disorder (OR: 3.6), non-teaching hospitals (OR: 2.8), weight loss (OR: 1.8), and chronic lung disease (OR: 1.6) were associated with higher mortality rate. There was no effect of type of procedure (trans-hiatal vs. trans-thoracic), age, gender, race, diabetes mellitus, congestive heart failure, pulmonary circulation disorder and payor-type on mortality. Conclusion: Preoperative factors associated with higher mortality after esophagectomy included patient’s co-morbidities, cervical tumor location and procedures performed at non-teaching centers. Further studies are needed to understand the referral pattern of these complex cases to teaching centers which impacts outcome.